Learn about the temperament and personality of the German Shepherd Dog. Discover what he's like to live with, his traits and characteristics and how he generally behaves. And look at lots of German Shepherd Dog photos. The German Shepherd Dog is loyal, bold and courageous. He's self confident and utterly fearless. He won't back down if challenged! He's highly intelligent and learns commands very quickly. Because of his high trainability and courage he's the world's number one police and military dog! He's protective of his home and family. You need to make sure he knows that you're the boss or he will appoint himself boss and can become overly protective and territorial. You need to lay down the rules from day one, and he needs to follow them! He's one of the most popular dog breeds in the United States. He's aloof with strangers and does not make friends indiscriminately. He's very fond of the children he's raised with. He's incredibly strong and athletic. He's a highly active dog who needs exercise and mental stimulation almost every day or he will get bored, and if he does he can become destructive with your property. If you're looking for a couch-potato this isn't the dog for you! He's known as a "one man" dog because he bonds more closely with one family member who he respects and trusts. He makes an excellent guard dog. 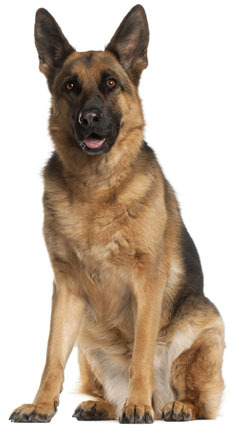 The German Shepherd Dog is the most intelligent and easiest to train of all dog breeds! He learns new commands quicker than any other breed, which makes him very easy to train. The German Shepherd Dog is a very heavy shedder. He sheds an awful lot of hair! You'll find hair all over your home, stuck to everything! You'll probably even find it in the butter!